Labour and delivery is a lot like free-fall parachuting. You can take classes to prepare. You may file a detailed plan for the (blessed) event. Still, jumping into the action with only your partner’s support seems scary. Even experienced moms can benefit from a doula’s help. Here’s how. Most moms agree: Labour and delivery nurses are angels in scrubs. Unfortunately, demands on nurses are intense. A doula is an asset even if you’ll receive one-on-one care. In labour and delivery, there are really two patients: you and your baby. Nurses must update charts, consult physicians and monitor the baby. A doula stays focused on you, start-to-finish. Studies show doula-attended labours are 25% shorter on average. Who wouldn’t want that? 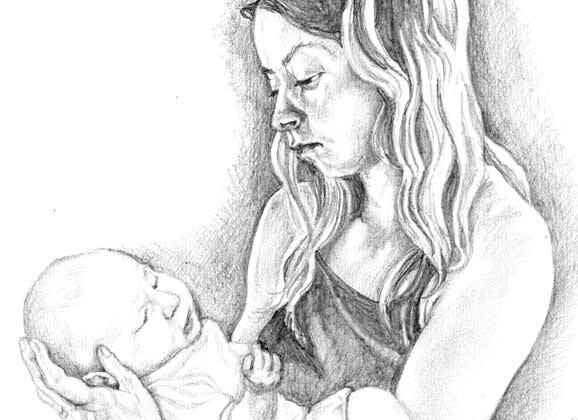 “Long, drawn out labour can be physically and emotionally challenging, even if a woman is medicated and ‘comfortable’,” says Ann Fulcher, program manager for the Hearts and Hands Volunteer Doula Program. Shorter labours are more effective, and there’s less time for infection or other complications to develop, says Fulcher. Doula-assisted moms are also less likely to receive epidural anesthesia, forceps delivery, or a cesarean. A doula’s tool kit often contains scented oils, ice packs, heating pads, and a birth ball. Doulas also know which labour positions relieve pain and increase effectiveness. Her bag of tricks gives you access to a range of coping techniques and leaves room in your suitcase for organic cotton onesies and post-partum snacks. And if you dislike the music she chooses or find the hot pad uncomfortable, your doula will redirect her approach without taking it personally. Your husband? Not so much. Even if you took Lamaze, you might forget what you learned when contractions start. Certified doulas study the childbirth process, pain management techniques and breastfeeding. Doulas typically meet with a client well before B-day to get acquainted, answer questions and make plans. This ensures you’re both on the same page. Doula-supported moms report less distress during labour, and emotional perks pay off physically. When you’re stressed the body releases adrenaline, activating the fight-or-flight response. “In simplest terms, adrenalin suppresses oxytocin, the hormone that makes labour happen,” says Fulcher. So if a mother is anxious, scared or angry, stress hormones may cause labour to stall. “That’s where the doula’s informational and emotional support comes in,” says Fulcher. Doulas are useful even for medicated labour and surgical deliveries. You’ll still want to share the emotional intimacy of childbirth with your partner. But, if you feel self-conscious about labour and delivery – and who doesn’t? – hiring a doula lets him assist you without seeing R-rated aspects, like trips to the toilet or violent vomiting. An extra pair of hands takes pressure off your partner and allows him to step away if (or when) he’s overwhelmed. It may sound like a doula will do everything but deliver your baby. She won’t. A certified doula’s professional standards of care and ethics don’t allow her to give medical advice or make decisions for you. She will facilitate interactions with the doctor by reminding you of questions you wanted to ask, which will help you help yourself. And she’ll intervene (politely) when your sister’s constant chatter gets on your last nerve. As you plan baby’s birth day, ensure you’ll have the labour support you need. Even with your heroic husband at your bedside, you might want to go pro.